New info below about the festival stalls! During the afternoon laid on some stalls which you might find useful, where you can ask and learn from experienced QI practitioners. When you arrive you’ll be asked to sign up for the sessions, first come first served. Please note the festival is an all day event, see running order tab below. When booking your train, please allow up to 40 minutes to get from the rail station to the venue, its really busy at rush hour. During the afternoon there will be time to develop your mission, think about how you might launch 15s30m in your organisation and chat with Rachel and Dan. We’ve also laid on some stalls which you might find useful, where you can ask and learn from experienced QI practitioners. Each “stall” will run for 20 mins, and repeat two or three times during the afternoon. When you arrive you’ll be asked to sign up for the sessions (we suggest you try two, if you’re super efficient you’ll have time for a maximum of 3), but so you have chance to have a think and chat with any colleagues (plan your strategy!) here are the options. A “First Wave”. Carrie Biddle, Cornwall Hospitals. 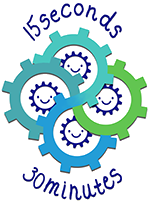 Carrie is our original 15s30m hero, and has launched 15s30m in her trust this Summer. Come and ask her how, what worked, what didn’t, what advice she has and what she’s doing next. Don’t miss it! B Get Tooled Up. Karen Fechter and Greg Madden, NHS Improvement. Karen and Greg have helped us a lot on our QI journey over the past 18 months. They can tell you all about the resources, training and tools which are out there which you can use and share with your organisation – there’s so much out there to help and support! C QI on the Wards. Anna Winfield. Anna is a Elderly Medicine Doctor at Leeds Teaching Hospitals, and one of the finalists from the award from which 15s30m began. She is a QI enthusiast and has loads of practical experience to share about measurement, spreading change ideas, and overcoming barriers. If you work with inpatients, you need to spend some time with her! D AAAGGGGH! How do I do this? Tilla Brook. Tilla is a leadership coach who specialises in helping NHS staff become ” the most chocolately version of themselves”. If you think 15s30m is a great idea but are wondering where to start in bringing it to life, spend some time with Tilla. E Unblocking your Change Idea. Helen Bevan, NHS Horizons. Stuck with a change idea? Helen will help you find the change agent in you and those around you. 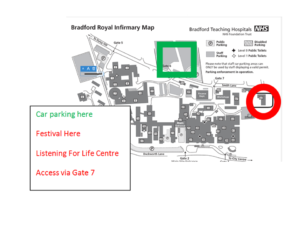 The Festival is being held at the LISTENING FOR LIFE Centre on the Bradford Royal Infirmary site. It is located off GATE 7 of the Smith Lane entrance to the hospital. We can’t emphasise this enough: if you ask for the main entrance you will be about a 5 minute complicated walk away from us – we don’t want to lose anyone! Do ask the taxi driver for GATE7, or the Yorkshire Auditory Implant Service, or Listening for Life Centre. Postcode BD9 5HL will bring you onto Smith Lane. Keep following Smith Lane until you see a blue sign that states Gate 7 on your left hand side (opposite Coniston Grove). Take this turning and carry on down the drive looking for signs on the left for the Listening for Life Centre. You will go round a slight left and up a slight hill. You will see the Listening for Life Centre here. Please note the pay and display bays are the parking spaces that are closest to the centre. If you park in a Zone 1 parking space you will be fined. Parking charges are from £2.50 for 2 hours to a maximum of £8.00 for the day (please bring change). There is limited parking outside the building; more parking spaces can be found in the main staff/visitors car park further along Smith Lane opposite the hospital – its opposite the entrance for Womens and Childrens, by gate 6. Bradford Royal Infirmary. (Please state the name of the Listening for Life Centre, Off Smith Lane to your driver or they may take you to the main hospital entrance). From the Bradford Interchange: Depart Stand E bus no. 620 via Smith Lane (Maternity unit). Please note the bus stop (no. 63876) is less than 300 yards on your left hand side. You will see a blue sign on the entrance to the drive that says Gate 7). Proceed down the drive of Gate 7. Follow the signs for the Listening for Life Centre on the drive to the left and up a slight hill, from there you will see The Listening for Life Centre. From the Bradford Interchange: Depart Stand F, bus no. 617 or 618. Please note you will arrive on Duckworth Lane opposite the hospital’s main entrance if you choose these services. You will then need to walk through the main hospital towards the exit for Smith Lane. When you have left the main building follow the path to the right which will lead to the Listening for Life Centre. Is the location accessible by train? There are two stations in Bradford: either is fine. Bradford Forster Square station is accessible from Leeds, Ilkley, Keighley, Skipton and everywhere in between. Bradford Interchange station is accessible from Manchester, Halifax, Hebden Bridge, York and everywhere in between. Anyone who is interested in finding out how they can make a difference in the workplace – to get themselves started in making change. It doesn’t matter if you have been leading on Quality Improvement for a decade or are only just starting out – you don’t need any background training or theory to join us. What will I learn at the festival? You will learn about our social movement, the impact of reducing frustration and increasing joy at work and how any staff member can get started tomorrow! Whether you leave with a single mission for yourself, or a plan to launch a trust-wide 15s30m campaign, the festival will give you the tools and space you need. The festival will be held at Bradford Teaching Hospitals NHS Foundation Trust, on the Bradford Royal Infirmiry site in the Listening For Life centre. For more details on the hospital site please see the Bradford Hospitals Website here. We will provide tea, coffee and a sandwich lunch. Please let us know of any specific dietary requirements. What do I do if I need to cancel my ticket? Please email us info@15s30m.co.uk directly so we can release the ticket to another delegate. What is the accessibility of the building? The building is accessible by wheelchair. If you have any other special requirements such as large print materials please let us know – we can also send out presentations ahead of time if you need to load them on your electronic device. Please call 07944639105 and speak to Dan.